It didn’t surprise me that in several controlled studies, senior citizens who practiced meditation demonstrated markedly less loneliness, lower stress and healthier physical responses as demonstrated by blood samples. Anyone who sees meditation as a hippy-dippy endeavor has found his or her view increasingly challenged by science in recent years. Meditation and other contemplative practices are continuing to claim their place at the table of mainstream medicine. This is true for a slew of reasons: chief among them, the recognition that hordes of us are stressed out, that stress wreaks havoc upon our bodies and that the practice of meditation has significant and measurable stress-reduction properties. In a recent study led by J. David Creswell, assistant professor of psychology at Carnegie Mellon’s Dietrich College of Humanities and Social Sciences, mindfulness-based meditation continues to reveal itself as a therapeutic powerhouse, with far-reaching influence on both psychological and physical health. Unfortunately no one has funded a similar study on hypnosis but since hypnosis and meditation essentially access the same mind/body state of relaxation I would be willing to bet the results would be the same. The question this brings up is really what is the difference if any between “guided meditation” and a formal hypnosis session? 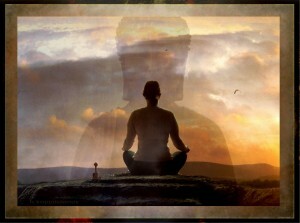 What is the difference between meditation and self hypnosis? Essentially the intention may be different but otherwise they are pretty darn similar. Both hypnosis and meditation quiet the chatter of the conscious mind. Both may utilize focus on the breath. Both have a range of depth of trance or depth of meditative state. Meditation aims to quiet the mind and just “be”. Hypnosis is generally focused on making a specific improvement in physical, mental or emotional well being. In meditation you attempt to watch your thoughts without judgment and aim to be present in the “now.” Letting thoughts come and go without attachment… In hypnosis you can literally “change the negative program and install a more positive strategy for solving life’s challenges”. They may look the same. They may feel the same. But essentially hypnosis is designed to create positive change. Meditation is designed to allow you to simply observe and practice non-attachment which may or may not lead to a positive change. In the article, “Fighting Loneliness and Disease with Meditaiton” the meditators definitely experienced a number of positive benefits, but they were pleasant surprises not “intended” results. Personally I enjoy having both options. I have also met long time meditation practitioners who had some specific challenges they were attempting to deal with in their lives and all the meditation they did served to enable them to be aware of the problems but not how to change them. The problem is that some of our patterns of behavior that cause us problems as adults, were installed or created when we were children. These patterns are now deeply embedded in the unconscious mind and it’s really hard to fix something that you are unconscious of because you don’t know it’s there. A hypnotherapist or NLP practitioner can help you to uncover and release these old patterns. The process feels a lot like…. guided meditation! The bottom line is that people who meditate are usually really good at hypnosis. People who respond well to hypnosis might definitely want to explore meditation as a way to strengthen their ability to relax and de-stress. An interesting side note: After meditating about writing this post, I observed that the article title is so typical of our western mindset of “Fighting” things like loneliness or disease. I guess it makes a better headline than, “Stopping Loneliness and Healing Disease With Meditation”. The very idea of “fighting” things is totally opposite of the process of allowing, accepting, noticing, and transforming. Have questions about hypnosis and how hypnosis can help you make specific changes that will improve your life, call me at 203-907-7710 or use the handy contact form below and I’ll contact you!